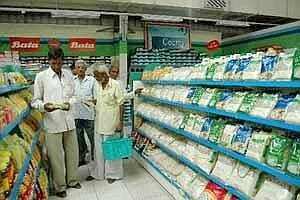 Mumbai: Shares in Indian retail firms fell and the country’s business community rounded on the government on Monday after the ruling Congress party appeared to have put on hold plans to open up the country’s $450 billion retail industry to foreign supermarkets. The beleaguered government paused its much-trumpeted plans to open up the sector, a senior government source said on Sunday, as Prime Minister Manmohan Singh fought to retain the support of his party’s allies amid a cacophony of dissent. Local retailers who stand to benefit from rules allowing global giants such as Wal-Mart to take a 51% stake in supermarket operations opened down as much as 10% on Monday. Any postponement or watering down of the policy, which some say will destroy the livelihood of millions of small shop owners, would be a huge embarrassment for the government, which has failed to pass any big-ticket economic reforms as it struggles with allegations of widespread graft. “Mr Singh has scored an own-goal by not even seeking out the support of his own party, never mind allies within the UPA (the government coalition), before his cabinet took the decision," the Hindustan Times wrote in an editorial on Monday. “That the (coalition) has been sailing in choppy waters without much of a compass to guide its journey becomes apparent." The government was likely to release an official statement regarding the issue on Monday. The main opposition, the Hindu nationalist Bharatiya Janata Party (BJP), has lead protests in parliament against the measure, which was passed by the country’s cabinet two weeks ago. Both chambers have been paralysed by vociferous dissent. Opposition to the measure was “to the detriment of the vast majority," wrote Ashok Ganguly, former chairman of Hindustan Unilever and Deepak Parekh, chairman of Housing Development Finance Corp, in an open letter described as “a call to the saner sections of Corporate India to come out and strongly support progressive measures." Shares in Pantaloon, whose Big Bazaar supermarket chain is seen by sector analysts as the number one tie-up target for a foreign supermarket, fell as much as 11% in early trade on Monday. Shares in Shopper’s Stop dropped over 9%, while Trent, the retail arm of the Tata Group conglomerate which already has an association with UK giant Tesco, saw its stock slide as much as 4%. Singh and his senior cabinet colleagues last week rejected calls to roll back the policy, opposition to which has drawn on deep-seated nationalism in the BJP, who decry the plans as selling out to western interests. The reform, as it was first presented, would allow global chains like Wal-Mart, Tesco Plc and Carrefour into the chaotic retail sector, and is seen improving supply-chains and cold-storage, and helping to tackle stubbornly-high inflation.